The technological advancement has ushered in lots of high-end and feature-loaded computing devices. Big computers have been replaced by lightweight laptops and feather-light notebooks. You can now turn any place into a powerful workstation, thanks to the latest USB hubs which can be carried anywhere in a laptop bag or even in a pocket. The availability of an astounding variety of USB hubs in the market makes it extremely difficult for one to choose a suitable and efficient model. Keeping this fact in mind, we have come up with a list of the top 10 best USB hubs in 2019. This slim and compact USB 3.0 hub features distinctively modern design. Made up of scratch-resistant and top-quality aluminum, this high-end device is capable of connecting your PC, laptop or notebook to such external accessories as a keyboard, mouse, card reader, pen drive and smartphone. Featuring the advanced 3.0 ports, this unit is capable of providing lightning-fast data transfer up to 5 Gbps. If you love watching movies or enjoy playing heavy video games, this portable and advanced USB 3.0 hub can transfer heavy files in a matter of a few seconds. This 4 port device comes along with a user manual and a sturdy 1.6 feet USB cable. Another attractive offering is the 2-year product replacement warranty card along with the 45-day money-back guarantee. Anker has established itself as a worldwide famous manufacturer of high-quality USB hubs and other computing accessories. 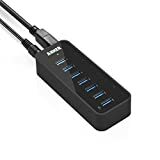 If you want to own a self-powered USB hub, this efficient tool from Anker can be perfect for you. This elegant looking device features 7 USB 3.0 ports and 3 Power IQ ports for charging smartphones. This portable and compact unit house unbelievable 60 W of power within its slim design. Made from a high-quality and durable material, this multi-featured device is compatible with Android smartphones, tablets, notebooks and laptops. The integrated surge protection technology imparts enhanced safety to your gadgets and external accessories. If you are looking for a reliable and durable USB port surviving years of usage, this super fast USB 3.0 hub can be the most suitable option for you. This compact and lightweight USB port from Sabrent is a unique blend of distinctive design and unmatched efficiency. It features four ports with bright LEDs which are duly equipped to show the power status. This portable device comes quite handy and convenient when it comes to portability and functionality. This 2.0 device provides fast data transfer with the high-level speed clocking 480 Mbps, full speed striking 12 Mbps and the even low speed easily touching 1.5 Mbps. This portable and convenient USB port can be tucked anywhere in the bag while you are on the move. Keep this user-friendly device with you to attach your laptop or notebook to such external devices as a mouse, keyboard, card reader and power banks. Considering all pros and cons, this small yet efficient tool is a must buy product. This feature-packed device will simply blow your mind with its advanced functionality and unbeatable user-convenience. The affordable price tag is another plus which makes it a great buy considering the kind of advanced specifications it provides at an attractive price. 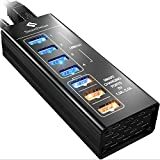 This multi-purpose device will help you connect your laptop, notebook to your smartphone and other computing peripherals by means of 7 ports. The device comes duly equipped with on/off switches for each port with LED lighting showing the working status. This lightweight and compact USB hub 3.0 provides ultra-fast data transfer rate, thanks to the latest 3.0 technology. No matter how many external devices you have to connect to your notebook, this feature-packed device will always come in handy to provide the ease-of-use and user-convenience. The ergonomic design of this compact and high-end USB hub is the highlight of this feature-loaded device. 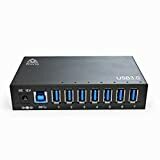 This 7 port USB hub comes in handy when it comes to attaching your laptop to such external devices as a smartphone, camera, tablet, printer, and webcam. Made up of durable aluminum, this sturdy device lasts years of usage. Duly equipped with ventilation holes, this efficient tool works for hours without getting heated up. This reasonably priced USB 3.0 hub allows amazingly fast data transmission up to 5 Gbps. You can now easily transfer heavy HD videos, movies, and photos. If multi-tasking is your prime concern, this unit is best-suited for you. Another durable, compact and extremely convenient product from AUKEY. Made from top-quality aluminum, this ergonomically designed USB hub features 10 ports thereby allowing you to attach external devices like keyboards, mouse, camera, webcam, card reader and even an external hard drive to your laptop or notebook. 10 times faster than your usual standard USB 2.0, this super fast USB 3.0 provides excessively fast data transfer up to 5 Gbps. Now sharing heavy files containing movies, videos, music, and photos are a child’s play for you. It comes duly equipped with the 36W power adapter which provides safety and protection while your laptop is connecting to multiple devices. Two-year product replacement warranty and 45-day money-back guarantee make it a great buy. 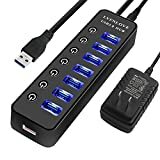 If you are tech-savvy working on the laptop most of the time, you must consider buying this value-for-money and user-friendly USB hub. This uniquely designed and portable USB hub is made from high-quality material. The ergonomic design of 7-Port USB 3.0 Data Hub makes it surprisingly lightweight, slim and efficient. This compact device can be easily kept in the pockets of your bag while you are on the move with all your computing devices. It provides data transfer at a lightning fast speed up to 5 Gbps owing to 3.0 technology. The self-powered unit comes in handy when it comes to charging your other gadgets at a high speed up to 2.1 A. 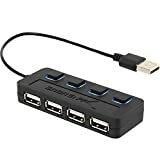 Compatible with both Mac computers and Windows, this USB hub is a must buy given its unbeatable performance. It comes in a beautifully packaged box containing a user manual, a 12V / 3A power adapter, and a 2.7-foot long USB 3.0 cable. One and a half year warranty is an added plus which will surely bring a smile to your face. Made from the durable and scratch-resistant aluminum, this sturdy USB hub body is nicely built with a non-slippery surface to provide the ease-of-use. This advanced and high-end USB hub sports distinctive design with 7 USB 3.0 ports in all to cater to all your computing requirements. 4 of these ports are data ports and the remaining 3 are smart charging ports which can handle multiple devices simultaneously when it comes to charging your smartphones and notebooks along with attaching external accessories to enhance user convenience. The smart charging ports feature blue LEDs that get along the overall distinctive design. The ventilation holes come in handy when it comes to keep the device cool. 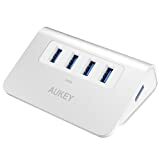 Compatible with most of the operating systems, this efficient USB hub just requires to be plugged into an outlet while it is attached it to your laptop. It works automatically without any extra work. This amazingly fast USB 3.0 unit will offer you up to 5 Gbps. Equipped with a powerful adapter, it can conveniently handle multiple devices. It is a must buy device considering the tons of features and ease-of-use it provides to the users. Made of high quality material, this USB hub is durable, compact and efficient. 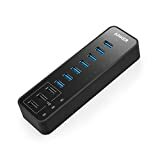 This 7 port USB 2.0 hub from AmazonBasics will keep all of your power-hungry devices connected to your laptop or PC simultaneously. The well positioned 7 ports provide easy access to all external computing equipment which you require to create a powerful workstation. With data transfer speeds up to 480 Mbps, this USB hub outclasses all other USB 2.0 hubs. Out of the total 7, 2 ports are meant for delivering fast charging. The headrest and armrests are nicely designed and well-positioned. It comes beautifully packaged in a box containing a user manual, one 5V/4A Power Adapter, a 3 feet long USB 2.0 cable and a USB 2.0 hub with 7 ports. This reasonably priced device is perfect for those who are on a tight budget but want to own an efficient and durable USB hub. 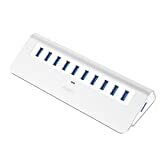 An affordable but amazingly efficient device, this 7 port USB 3.0 hub is lightweight and compact enough to be kept anywhere inside your laptop bag. This reliable and stable device can keep your notebook or laptop connected to your external accessories whether you are at home or outside. This advanced USB 3.0 hub is capable of delivering blazingly fast data transfer speed at 5 Gbps which makes it outclass every other competition in the market. If your devices support USB 3.0 hub, you must go in for this value-for-money product which will not only provide super-fast data transfer speeds but also gives you the option of switching between self-power mode and bus-power mode. This plug-and-play device comes duly equipped with a 5V/2.5A power adapter which works efficiently when you need to connect a number of devices at a time. Compatible with all the latest operating systems, it gets along with all the devices featuring a USB connection. If you want to own an affordable yet advanced USB 3.0 hub, just go in for this variant without any second thought. All these USB hubs are equipped with advanced features which allow you to connect multiple devices to your computer, laptop or notebook. You can choose any of these efficient tools keeping in mind your requirements and budget. If you are on a tight budget we have some really worth buying options for you. If you want to own a value-for-money and highly reliable USB hub with latest features, you needn’t look elsewhere. This earnestly prepared list of the top 10 best USB hubs contains the latest and high-end devices.